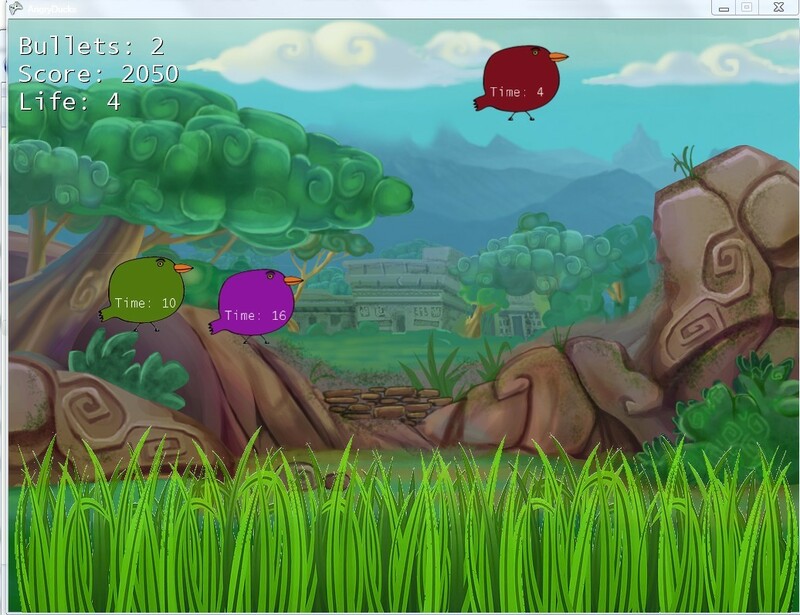 So I made this prototype using XNA over the past weekend. It was called “Angry Ducks” and you can consider it a silly salutation to the NES classic “Duck Hunt”. You are a hunter sent to a mysterious land to hunt these bizarre birds. They are carefree and sometimes tend to be naughty — when they see you they will fool around a bit, laugh at you and fly away. However, when wounded bad they become angry and destructive — they will accelerate, charge into their enemy (in this case, you) and explode!! There are three different types of angry ducks (100, 200, 300 points respectively), each with different parameters. Your gun can load up to 6 bullets at a time. If you keep clicking the left mouse button when running out of bullets, the system will automatically reload for you. You can also click the right mouse button to reload, which is faster than the automatic way. If you hunt down a duck, you will get the full points of that duck. If a duck explodes, which means you fails to hunt it down, you can still get half of its points but will lose 1 life. If you lose all 5 lives, you lose the game. Your goal is to survive all three levels and, if possible, get a score higher than 3000 points.